The word gold can make any person’s eyes light up. You will be amazed when you hear that there’s more than 165,000 metric tons of gold is already mined all over world till 2011 this was the best estimate of the world’s total gold in weight. If we consider 1600$ per troy ounce cost than total cost of gold across world will be 8,487,797,102,400$. More than half of humanity’s gold has been mined from the earth in the past 50 years! Now the world’s richest deposit are fast being depleted and new discoveries are rare. Which indicates gold price will rise further. How much gold, really is 165,000 metric tons? 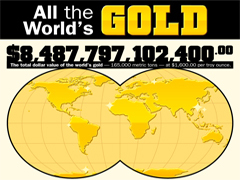 To break this down, almost four Olympic sized pools could hold all the gold that has ever been mined. Also, if everyone on earth were to get their fair share in the world’s gold total, each person would receive five gold rings! One major question is, how is this mined gold used? Just around 52 percent goes to the jewelry trade. Then, 18 percent makes up the total holdings of the world’s central banks,16 percent to investment,12 percent to industrial usage & 2 percent is unaccounted. Which nation consumes gold most? Incredible India again wins the game by consuming 745 metric tons of yellow metal gold. Most of the gold consumption is in terms of jewelry. What is happening with gold prices? The trend since 1900 has been raising gold prices with occasional sharp volatility. Look at Following Infographic which shows amazing facts about gold. Did you enjoy this infographic ? Don’t be shy, comment below and let us know ! For more useful content please don’t forget to subscribe to the RSS-feed and follow us on Twitter and Facebook! If you enjoyed the following article we humbly ask you to comment, and help us spread the word!